Synopsis: The body is a central reality of culture and a fundamental site at which culture is expressed in action and in thought. Yet anthropological analyses continue to regard the body as a cultural artifact - something static, objectifiable, and removed from the everyday experiences of living in society. 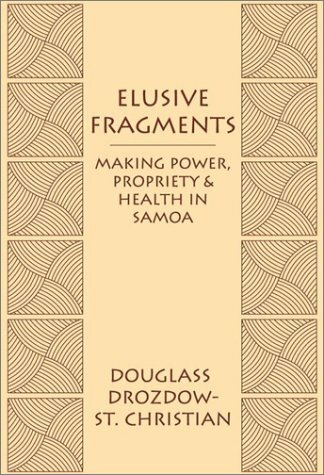 These are the central ideas in Elusive Fragments: Making Power, Propriety & Health in Samoa. In this book, the author argues for another way of thinking about the body and bodies. Based on ongoing field research in Samoa, the author describes everyday processes of village and family life as the primary sites through which the body works as an agent of cultural production. By locating the body as a process of awareness and enactment, he links it with Samoan concerns for dignity, humility, and strength, thereby illuminating central dynamics within Samoan culture. About the Author&colon; Douglass Drozdow-St. Christian is an Assistant Professor of Anthropology at the University of Western Ontario.